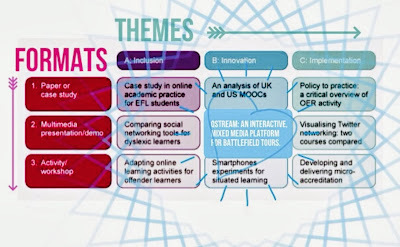 From the start of the Open University postgraduate master’s module H818: The Networked Practitioner I’ve aggregated screen grabs and photos into a dedicated album in Google+ ‘Picasa Web Gallery’. 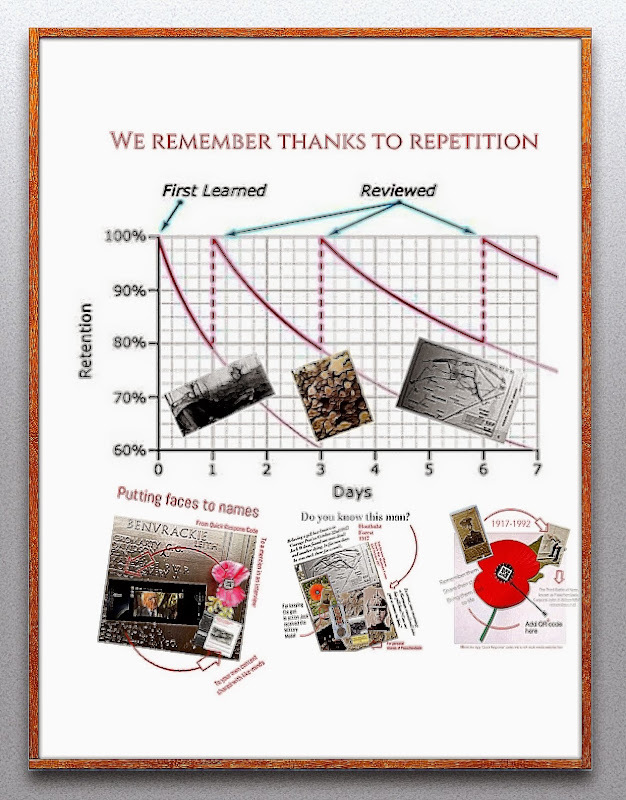 This, as a resource and aid memoir, also received copies of images from other albums, including the another two albums on elearning that contain some 3000 images from the six MAODE modules that I have done over the last four years and from other albums on the First World War and specific museum visits, including: the Museum of London, the Great North Museum, the Design Museum, the ‘In Flanders Fields’ and ‘Talbot House’ in Belgium, as well as inspiration and insights from the Picaso and Miro Museums in Barcelona and Alcatraz in the Bay of St.Francisco. 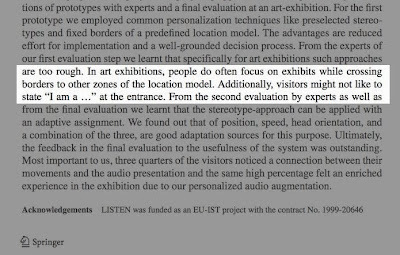 My interest in museums is lifelong and something emanating from them or to support them had been an intended topic for my last MAODE module H809. My interest in the First World War is also lifelong, fed by my late grandfather, a veteran of that conflict who lived into his 97th year – long enough to attend various events to mark the 75th anniversaries of the Battle of Passchendaele where he served as a machine gun corporal and the formation of the Royal Air Force as he had transferred to the Royal Flying Corps at the very end of 1917. Given the approaching centenary of the 1914-18 War I took the decision to enhance and formalise my understanding of the conflict with an MA in British First World War studies at the University of Birmingham. I further justify this by valuing the insight of doing a ‘traditional’ though part-time MA that requires attendance at lectures, and a substantial amount of reading – even from books, some of these a century old and getting a taste for another institution’s online offering. Here are my mashed up notes from a lecture on reviewing a text. First ideas were around the use of QStream, a platform with its origins in supporting junior doctors in North America to pass tough written tests of their knowledge. Simply shoehorning in an idea rather than seeing what needs exist, or problems there are, say with museum or battlefield visits isn’t to be recommended. 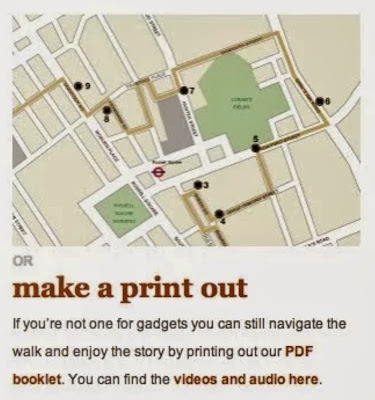 It was necessary therefore to try out for myself some of the mobile guides, for example City Walks. I knew from experience the year before that QR codes had been used in the Digital Crystal exhibition at the Design Museum – efforts failed here as the promised free wi-fi didn’t work. A visit to the Museum of London was more satisfactory though throughout my visit I never saw anyone use them – spoilt for a wealth of activities and options, including touch screen interactive and computer consoles alongside many tactile and engaging ways to enjoy the exhibits perhaps rendered them redundant. Most treasured visits to museums include the Royal Academy of Arts where my mother took my daughter, then 12/13 under her wing. I was also impressed by the quality of the audio guide at Alcatraz that featured the voices of inmates and prison officers. Reading I do always includes some kind of note taking; how I achieve this using digital tools varies. A significant, if not most of my learning is done via an iPad. Experimentation and habit has me use Kindle tools to highlight, tab and add notes that I later review and grab, while with papers I typically do a number of things: cut and paste a Harvard reference into my OU Student Blog which I use as an ePortfolio, as well as saving into RefWorks, while downloading the paper to a dedicated module folder. Rather than take notes, which I may do in front of a computer or very rarely these days onto paper, I will, as here, highlight and grab then later annotate and potentially post with notes and tags into a blog. 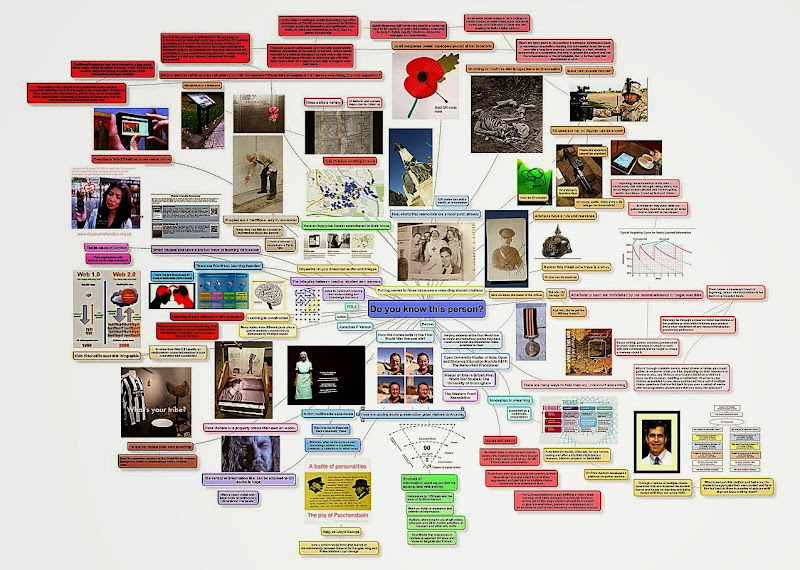 My established habit is to deconstruct a task into its component parts – in this case an early step towards a ‘multi-media artefact’ using SimpleMinds, a favourite App that I have on the iPad and Mac-Mini. 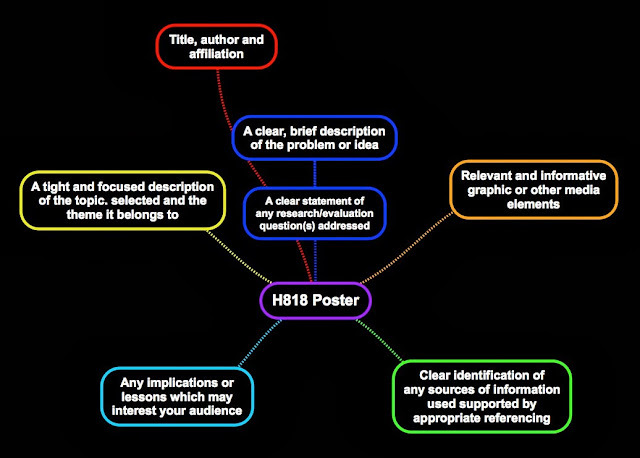 This detailed mindmap was an early step in assembling a ten minute presentation I gave on OULive on Monday on the potential and pitfalls of using Quick Response codes in education. Its next iteration was as a Prezi. It was ultimately delivered as a PowerPoint consisting of eight or nine slides. Here I took some of my grandfather’s photographs and mashed them up using the apps ‘Studio’ – a graphics/sharing app and ‘Brushes’ – the iPad ‘painting’ app favoured by David Hockney. Together these allowed me to assemble layers of photographs, text and graphics so that I could express an idea visually. At some stage I had the idea of putting a Quick Response in a Royal British Legion Poppy – as much for the promotional grab of the image as the practicalities of doing so. 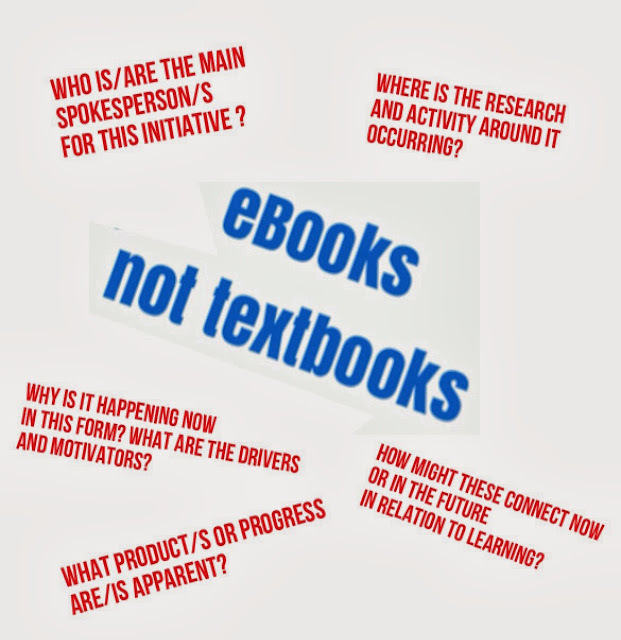 In a module titled ‘The Networked Practitioner’ that is part of the Open University’s ‘Masters of Arts in Open and Distance Education’ the prompt to use, indeed the necessity to at least try a variety of sharing platforms is inevitable. Within the ‘walled garden’ there were module, student and tutor forums, OpenStudio, and wikis, while managed exposure beyond these walls included use of Cloudworks and the Open University student blogging platform. 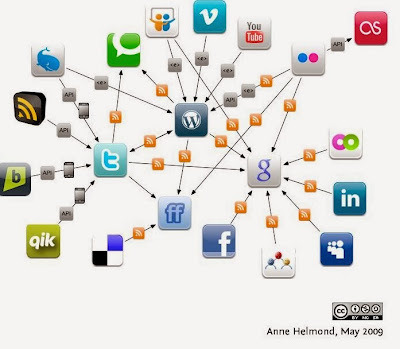 My own extensive use of external platforms includes blogging since 1999, and has developed to include: Linkedin, Facebook, Google+, Twitter, WordPress, Flickr, YouTube, Stumbleupon, Pinterest and others. Flickr and blogging has brought me to the attention of the BBC and National Trust, as well as individuals able to support my specific interest here on the First World War: a blogger in Belgium, the grandson of a veteran, a local historian in Hastings, a post doctoral researcher at King’s College, London, an author writing on the First World War for the National Trust, the Western Front Association who have published my grandfather’s story and a researcher and subsequently the BBC to feature in a story in their ‘People and Places’ series. Picking a Creative Commons copyright attribution only came after slides had been submitted to the presentation coordinator. Even once having reduced the number of slides proposed and having greatly simplified the images to be shown the need would then ideally to have added the CC as yet another layer onto these images – all the more reason to leave this task to the end once I had reduced some 32 images down to 8. Further simplification would be to restrict my use of images to my own photographs, charts and drawings. An attribution I may have circumvented is to acknowledge or link to Apps such as ‘Studio’ and ‘Brushes’ while I find it all too easy to lose track of where an image was sourced given how many screen grabs I do and photographs I take every day. Future plans would be to expand the thinking expressed in the OULive presentation to include a platform such as QStream that feeds by email spaced repetitions on a subject. I imagine a teacher, rather than the secondary school student, assembling a ‘cheat sheet’ of key facts as a revision sheet that is then offered back to them on their phone until, literally, they ‘have it in their heads’. This I base not only on the idea that managing our inclination to forget is a necessary part of formal learning but that only once you have aggregated enough ‘stuff’ on a topic in the brain can it be expected to make its contribution by enabling you to answer exam questions, but also by offering and allowing you to formulate your own ideas. 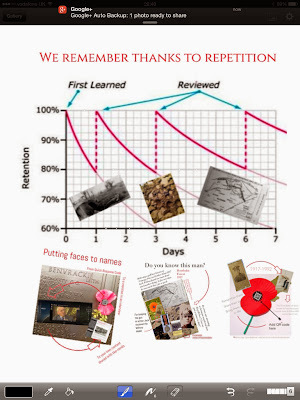 It was with this in mind, taking an interest in the centenary of the First World War and obsession with war memorials that I started to think about using Quick Response codes as a personalized entry point to the Web that anyone could generate in order to share a story about someone who served in the conflict, and to do so both online and on the street. Where QR codes have been successful is in targeted learning experiences in schools (Tucker, 2011; Gradel & Edson, 2012), where the affordances of the QR code have been exploited to form part of an engaging, constructive and collective learning experience. To be effective this initiative with war memorials requires galvanizing people to take part in a joint exercise – easier with a class in school or college, less easy with the general public unless it is through a national, regional or local community association or interest group. Connections won’t occur however unless they are nurtured. By way of example, wishing to support and promote the combat memoirs of my late grandfather John Arhtur Wilson MM (Vernon, 2012) a number of organizations will be approached up and down the UK in relation to his experiences in the Durham Light Infantry, Machine Gun Corps and Royal Air Force. The Web will both help identify, forge and maintain and develop first and subsequent connections in what would hopefully be, to be effective, a two way, shared, open and reciprocal relationship. The beauty of having content already online is that others can quickly view it and images, text and sound files, even video, adjusted to suit different audiences, or uses – and used freely where appropriate copyright permissions are given. There are many examples where local councils feel a war memorial or building is so important that they have invested in information placards on site (Fig. 7). As commemoration of those who served and died in the First World War is of local and national interest funding is potentially available to help support initiatives such as these through the Heritage Lottery Fund, while organizations such as the Western Front Association have funding for branch activities too. 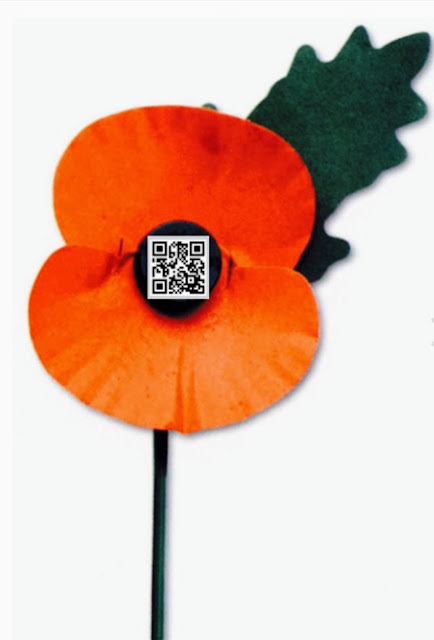 If permission is required for personalization of a British Legion poppy using a QR code, then alternatives may be required, from working with other suitable groups such as the Imperial War Museum or Western Front Association to putting the QR code on a badge instead. I was up at 3.30am and I’m not even presenting. It brings out the vampire in me. I use these early hours to write – pulling together ideas before they blow away in the wind of daily life in a household where the number of teenagers has suddenly doubled. We have the older teenager couple, and the young teenager couple … and the parents of two of this lot looking at each other and thinking ‘we’re teenagers too’. Three hours of short presentations and without exception each has an impact and contribution to my thinking an practice. This despite the presence of a lorry full of blokes with pneumatic drills who attacked the house an hour ago – cavity wall insulation. I am sitting here with industrial strength headphones – for a ‘test to destruction’ I’d say that these Klipsch headphones are doing their job admirably. I ‘suffer’ from having acute hearing … I do hear the pins drop a mile away. I need headphones like this whenever I leave the house otherwise travelling is a nightmare. The great value of a session like this is to listen to your fellow students – a voice, more than a face, evokes character and conviction. Not that I ever doubted it but everyone is clearly smart, focused and keen to ‘play the game’ when it comes to using online tools. The OU has a habit of designing the life and risk out of a module. Bring it back. Vibrancy and energy are born of risk.